This series looks at four techniques of the most successful United Methodist churches in America. While the techniques could benefit any church, they have serious dark sides. 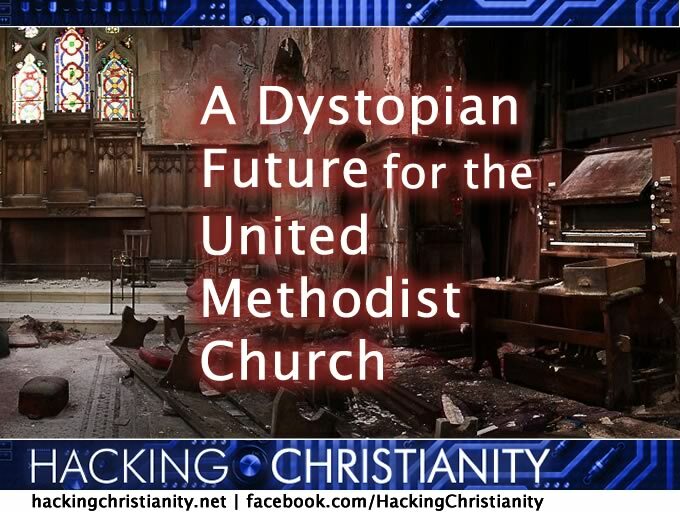 A dystopian future could await United Methodism if these techniques become widespread. Multi-site: they worship in multiple locations throughout a community or region. Piped message: they export their sermons and sometimes entire worship services to multiple locations. Sermon series: they have 4-8 week sermon series, which in some cases become book deals or curriculum. One Magnetic Personality: these churches are ran by one well-educated and charismatic clergy, who is often a man. In this series, we will look at these four techniques and examine the dark sides of these techniques and the dystopian future that might emerge if these become more commonplace without serious reflection and persistent accountability. It is no secret that this blog is cautious about multi-site churches. For years we’ve called them Wal-mart churches, fearful of the dark sides of what might happen if the big church in town buys out the small churches in town. You can click those links to read more. But it wasn’t until last week that I was given one of the most egregious examples yet of why multi-site is a temptation that is best tread lightly. Big Shiny Church is a large church in a metropolitan area of the South Central jurisdiction and it had an interest in a second location in a different part of the city. Big Shiny Church started not looking for spaces to rent, but instead focused on which shrinking United Methodist church they could take over. On at least two occasions, their Associate pastor snuck into a church without the pastor’s knowledge and took pictures, measurements, and discussion with a willing laity about taking over the parish. The chain of command was activated: the current pastor of that church called the District Superintendent, who called the Bishop. The pastor of the Big Shiny Church called the smaller church pastor and, incensed that the Bishop had been called, said that as punishment they were “taking that smaller church off the table of considerations of partnership.” They ultimately went with another local church who recently announced their partnership as a multi-site location for Big Shiny Church. So in summary, a large congregation with means was seeking out which United Methodist churches were vulnerable to takeover or “partnership” with or without the small church pastor’s consent…all in the name of going multi-site. It reminds me of Pretty Woman, a 1990 film starring Richard Gere as a vulture capitalist. He had a big company with lots of money and would buy out vulnerable companies using money and political leverage. And my fear is that if megachurches and large churches with personality and means start using those to take over failing churches and replace their worship experience with Big Shiny Church brand. The only reason we even knew this was taking place was because of the sharp eyes of a United Methodist Women’s group–always the group to be in good graces with–and who knows how many other sites Big Shiny Church visited. Large churches will cease support for small churches in the hopes that they would fold and their properties go up for sale. Or they will give tacit “support” and then emerge as a benefactor when things get bad. If the consumerism mentality takes over a church growth model, I am wary of human sin taking over as well. Small churches will be willing to sell out to have a better chance of success. With our growing focus on metrics, the temptation to give in and sell out to get better numbers may be more than local churches can resist. Connectionalism takes a hit as those local churches would fall under the authority of the megachurch, not the district. Leadership at those sites could be appointed positions or they could be hired hands without accountability or itinerancy to the larger UMC. Ultimately, this is a question of “What effect does Consumerism have on church growth models?” The most mind-numbing of all this is what the Associate of Big Shiny Church said “who wouldn’t want to be part of Big Shiny Church?” Such a statement reeks of “we’ve got a great product that everyone wants, no matter their situation.” Church differences, regional variances, cultural expectations are all thrown out the window because since it works in one area, it will work there. Consumerism plain and simple. I am fearful of the dystopian future where large churches get bigger and multi-site and small churches become like the mom-and-pop stores in the face of Wal-mart and are unable to compete with the Big Shiny Churches. The onus for avoiding this dystopia is on the large churches doing the hard work of avoiding a consumeristic mentality in their strategy and not using tactics like spying and sneaking around to achieve their goals. The ends do not justify the means. Can large churches legitimately partner with smaller congregations if their intent is takeover? Or should they be up-front of their desires? Would it affect a smaller church if they knew they were in takeover talks with the larger church? If in our dystopian future, what is the value of smaller churches in the face of multi-site streamed high-quality worship services? This is a four-part series, next is on the effect of Piped-in worship and preaching. See you then. Thoughts? Thanks for your comments, both here and on Facebook. Who’s the ‘our’ and ‘we’ here? Are you working with some folks on developing this critique? Or are you using some sort of ‘royal we’ usage. It’s confusing to most US readers. If you look, I usually use “we” and “our” on blog posts because their inspiration and content come from the blog community and engagement, not just me opining away. Understood, but the grammatical nature of the “royal we” is that the monarch presumes that they speak for their subjects when it’s largely NOT a product of any dialogical process. I’m wary of any blogger who presumes to speak “for” or “on behalf” of a conversant group because it becomes dicey to tell where the conversation ends and and one ‘voice’ begins to overwrite the agency of others in a discourse/praxis/action. But enough about my dissertational obsessions…I’ll make another comment on the content itself! I would counter that, in almost all of its uses on the blog, the use of the term ‘we’ is not monarchical but collective/corporate, indicating actions of the blog itself (rather than of the author, where Jeremy uses ‘I’). He’s actually rather consistent about this: ‘we’ is generally connected to something the blog (as a publication) has done or will do, not what the readership feels or should do, which is what you appear to be implying. I wouldn’t say he’s being monarchial at all. I think it leaves him open to the perception that he might be ‘speaking for others’ to those who are linked here from the various places that pick it up. Tangential to the issue, but shouldn’t this pastor and associate pastor be charged for “behavior that undermines the ministry of another pastor” (para. 2707.1(f)) ? More directly, I think this is another example of our current struggle – how do we define faithful ministry, how do we evaluate our congregations, and does success in raising attendance/budgets justify unethical behavior? My concern with this model is particularly the “piped message” effect. This violates the congregational side of our denomination’s history whereby the laity were the driving force in determining the character and content of a congregation. The clergy were simply there for a short time to ensure that things had a direction in the general tenor of the Methodist movement. This goes back to my concern that “connectionalism as uniformity” has replaced “connectionalism as communion” in how The UMC understands the relationship between its diverse churches and members. Good piece. I wonder if Big Shiny Church is as big a threat as we think though. With many of their attendees being seekers of novelty, the lives of these congregations are far shorter and their attendees significantly more transient. Rather than the WalMartization of church, I fear we’re creating a nation of church-hoppers who are going to greater lengths to be “fed” and completely leaving behind the notions of church membership and involvement. I spent a summer traveling around to Big Shiny Churches, meeting celebrity pastors, worshiping with them, etc. If you ever want to compare notes, shoot me an email. I don’t think it is a threat. I do think that there are difficulties with some approaches that need to be self-corrected. There are your true feelings. So, you are creating heat without light. A forced takeover of a currently viable (minimally paying its bills and apportionments without conference subsidy) congregation would be wrong. But, this Chicken Little approach prevents any reasonable discussion. Perhaps in addition to “LookAt*ME! *FiddlingWhileRomeBurns” the agenda is “Don’tLookAtTheWesternJurisdictionMeltingAwaySoLet’sTalkAboutAnythingElse.” What are your preferred solutions? Rather than tear down some paths that are working for many, it would be productive for you to describe something that actually works. This is another good point. It seems we’re turning the church into “what the congregation wants to be” rather than “what God wants us to be for the world” sometimes. It makes me recall the “they” of miracle/healing stories (“They bought to Jesus a man who was deaf…”) who were largely looking for a good miracle show rather than interested in becoming a disciple. Hey Jeremy. A couple of things. If I read this post right, the primary concern lies in how we best provide leadership for local congregations that matches local personality and flavor. It would seem to me that you believe a singular appointed pastor is more likely to tailor a local ecclesiology/theology for a local congregation than a larger mother church. Yet I’m not sure that’s a good assumption to make. It’s a little simplistic to think that all mother churches would seek to replicate their own DNA verbatim on any local churches who yolk themselves. I think equating their model to Wal Mart is unhelpful, as nobody is really talking about that. Seems like a straw man. If there is a reason why an individual clergy person would do a better job leading a congregation, then I want to hear it. But if there’s something aesthetically displeasing about a larger benevolent institution trying to help out, then let’s talk about that. Naming one anecdote of a jerk pastor isn’t necessarily the way to go about it. Let’s talk trends. Jeff, your identification of the primary concern is actually a preview of tomorrow. A lot of your comments will come into play tomorrow where I talk about the piped message effect. Today’s post is primarily about this approach where large churches are seeking to consume smaller churches. I agree that the Gere parallel is not direct as to the effects of his takeover but the approach seems a likely parallel: to seek out vulnerable churches and take them over. The multi-site movement is fascinating and inevitable. My efforts here are to talk about the dark sides and rough edges of this movement and to keep it in a direction that I think is more authentic to the “church in many houses” ideal. If we don’t call out the outliers and the shenanigans–which you call straw men–then others may try the same approach. I think it is important to keep the whole movement in check. I don’t think I’ve been living under a rock but I have never heard of this multi-site church movement. Do the smaller churches keep their own clergy? If so is the pastor from the bigger church a new level of authority between superintendent and smaller church? If that’s the case not sure that I like that. If the pastors of these large churches are the reason for the vitality of these churches why are they not transferred to others to effect change there? Is this a way of obtaining more central control? Also I would like to add that small churches can be vital. In new church start speak, this is referred to as the “Adoption Model” of church planting, where in an aging church isn’t able to meet the needs of the local area over time and seeks the help of a larger congregation to jumpstart things again. There’s a lot of pastoral care that has to be weighed with this model … Namely, no matter how small the original congregation gets, they’re still there with their values, hopes, and dreams. But there’s a lot of humility involved as the dying church has to be the one to give it up for a new phase in ministry. There have been a few cases of this approach being very successful (you’ve named a couple). It takes a lot of care from the cabinet and the adopting church to get it right, but it seems to be a viable approach to revitalizing ministries in neighborhoods that are game for it. Laura and Jeremy, you both need to begin equating MONEY (especially the size of a pastor’s salary) with power in the UMC. If a pastor earns more money than the District Superintendent, he/she has more power than the district superintendent. This means that the rich pastor can make appointments. I’ve seen it happen on several occasions. The rich pastor doesn’t need to bother with pastors who felt so called by God that they gave up their life-savings to attend seminary and struggled to get through the BOOM process. Instead, the rich pastor looks for some person to “mentor”; and hires that person to be on the church staff. Then the mentee can be commissioned to be the pastor of the second site. He or she is supported through seminary by working part-time at the new site while attending seminary or the course-of-study, and by getting paid a full-time salary as a new church start pastor (whose $50K salary package is paid for by conference church development funds). Money is power in the UMC. If a person earns more money than the bishop and district superintendent, he/she has more power than the district superintendent. Having NO upper salary limit for clergy is at the root of many problems in the UMC. Clergy compete for money/power/appointments, and do not cooperate in ministry. We absolutely reflect the capitalistic culture we live in. What would happen if one of our large church pastors decided to quietly give 90 percent of his salary directly to the poor? (Most could certainly do so and could live comfortably off of their savings for the rest of their lives.) I would have a new respect for such a follower of Jesus Christ. In 2005 Barna associate Thom Black made an audio presentation to the National House Church Conference in Denver, Colorado. In that presentation, he shared research trends about the “revolutionary” change that is occurring in the Church. The presentation describes trends that bring warning of a potential massive exodus of highly committed church members from all churches, including the superstar evangelical megachurches, by the year 2020. If trends continue, only a third of highly committed Christians will practice their faith within a local church. I encourages folks to listen and decide for themselves. It’s very important to understand the symptoms of these downward trends, but beyond this understanding lies the more difficult challenge of interpreting causes and developing solutions. Our USA ecclesiology is still stuck in the 1800s, but Wesleyan connectionalism shows great promise if adapted to the present day, as it has in third world disciple making movements such as CPM, T4T and the gigantic cell churches. A thought about the appeal of this model: Has it ever been noted that the itinerant system is no longer unique to UMC pastors? We are all essentially itinerant. Very few professionals expect to remain in the same job, or even the same place, for their whole careers. How many people under the age of 40 do you know who get a job, get married, have a baby, buy a house and say “Okay, here’s where we live and work for the next 50 years”? I can only think in terms of 5 years – maybe 10 but that’s stretching it. I’m committed to a church right now but there’s a good chance that we will relocate at some point – as is true for our fellow young adults. There is a senior adult class at our church that still has the same members who formed the class as young couples. I doubt our young adult class will remain intact in 2060. If that is the case there is little guarantee that our church will have much continuity over the upcoming decades. So while I don’t approve of personality-driven churches with mega-pastors who oversee church colonies I do understand the appeal. At least the model provides some consistency in the midst ever changing 21st-century life. Dwight L Moody met a lady discontent with his method of evangelism in the 19th century as she complained, “Dr. Moody I deplore your method of evangelism.” His response, “My friend what is your method of evangelism?” She replied, “I have none”. Dr. Moody stated, “I prefer my method, which could be improved upon, over you method of no-evangelsim”. I know Adam Hamilton, Mike Slaughter and Jorge Acevedo personally. Their hearts are to reach those who are far from God and help them become disciples of Jesus Christ. There is no “take-over” mindset in their thoughts or actions. They want to see every local church to be a vital witness for Christ. All four of us speak regularly to existing churches, districts and annual conferences to help existing churches Make Disciples. Why can’t we celebrate resurrection? The four of us have sought nothing more than to revitalize existing churches and begin new worshipping communities to reach people for Christ through Wesleyan faith and practice.